God, the Father created the heavens and the earth; Jesus Christ, the Son, died for our sins and redeemed us; and the Holy Spirit, guides and teaches us personally and professionally, teaches us through God’s inspired Word, the Bible, our ultimate authority of faith and conduct and through the communion of Christians. 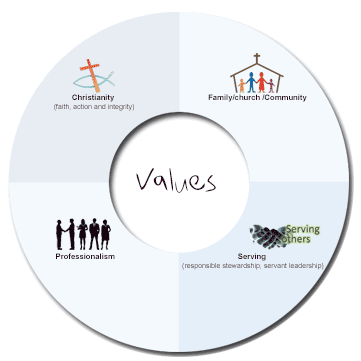 ACC values Family, Churches and Communities and believe they are essential components of society. Contemporary society is increasingly diverse and complex and the forms of families have changed rapidly. In order to enhance the health of society, we must improve the health of family dynamics, solidarity of churches and communities. The ACC believs that through recovering families and the relationships within, supporting and strengthening churches, and increasing cohesion in the community, we can impact society in a positive way. ACC values excellence, and believe that the Biblical Jesus was the perfect example of excellence. The demands of a fast moving global economy, and rapidly changing world, professions and skills must keep up and meet these demands. The ACC is committed and focused on provide professional and relevent education to meet the current demand, and give graduates the edge they need in the modern world. The ACC is committed to help individuals to be contributors to families, churches and communities. The ACC has a core focus on restoration, and through education and training aim to teach student’s self-restoration and equip them to restore those around them. The ACC equip individuals to have servant-hood in their life, workplace, church, and the community.